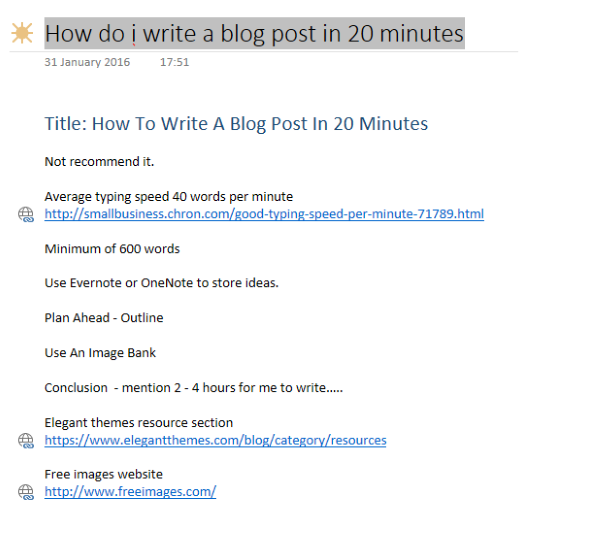 The first thing I want to say is that I really don’t recommend writing a blog post in 20 minutes but it’s a question I’ve been asked a number of times by busy business owners who usually have less than half an hour free to write a post. Please, spend longer than 20 minutes, your readers will love you for it but….. if you don’t have much time then check out these tips. When you come to write your post the thinking will be done and all you have to do is focus on the writing. At the moment I’m using Microsoft OneNote to store all my post ideas but Evernote is also good or even a paper notepad. One reason I prefer software is that I can drop web links, research and images into one place and also make a note of ideas when I’m out and about on my phone. The screen grab above shows the notes I created for this blog post. There’s not much but it’s enough for me to remember what I want to say. Creating some sort of list of where you want to go with the post before writing will also save you a bunch of time. Outlining can be as simple as making a note of headings or you could write the whole structure of the post including bullets for all the points you want to make. If you really want to go the advanced option with outlining then have a look at the Workflowy app that specialises in all things bullets. I tend to stick to a simple list of headings which works for me but experiment and try your own thing. As you’ve only got 20 minutes then the last thing you want to be doing is messing around with images so create your own image bank of stock pictures and icons that you can use quickly within your blog posts. I don’t tend to keep photo’s within my own image bank but I do have quite a number of icons (like the one on the right) and open source graphics that I can use to make points. I keep these in Google Drive so I’ve got access to them on my desktop and mobile. Spend some time taking your own photo’s that can be used to describe the subject matter you write about. Build a large collection and you’ll be able to dip in when you’re in a rush, pick an image and slot it into your post. Quantity is important. You don’t want to be repeating the same image over and over again. A good place to find icons and graphics is the Elegant Themes Resource section, scroll through the posts for a couple of years to find all sorts of downloads. If you’re looking for images then have a search on Free Images. 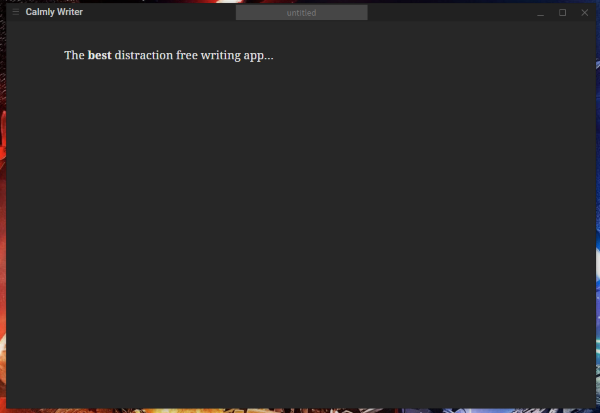 Go Distraction Free & Write Like The Wind! Its now time to write! If you want to get done in 20 minutes you’re going to have to go distraction free. Close email, social media and switch off your phone, all you need to do is write….. it’s only 20 minutes, the sweats shouldn’t be too bad! I write with Google Docs using the Full Screen mode which you’ll find under the View menu. I’ve also used Calmly Writer an awful lot and it works if you’ve got the Google Chrome web browser installed. I can’t recommend it enough, no toolbars, just you and your text. Another great thing about Calmly is that if you click CTRL+U you can grab all the HTML code for what you’ve written including the headings and then just past it into the Text View box on WordPress. Now we’ve got rid of the distractions it’s time to write like the wind! The average person types at around 40 words per minute which gives us 800 words in 20 minutes. Take time out for sips of coffee and scratching and you should be able to manage a 600 word blog post with ease. Speel check as you’re writing and look for that squiggly line so you know when to make corrections. Try and read each sentence out loud after you’ve written it. This way you’ll spot any grammatical problems. Phew! How are your fingers? It can take me anywhere from 2 – 4 hours to write and publish a blog post, I know, I’m slow! I really tried to write this is 20 minutes but totally failed. I can spend that long proofreading and editing. Spend as much time as you can on your posts but if you can only grab 20 minutes here and there then planning ahead will be your savior. If you’ve enjoyed these tips then you can get more on my Twitter account or by signing up to my weekly email newsletter that offers up even more tips. As an incentive for signing up I’m giving away a whole bunch of fact sheets to help you with blogging, Social Media and SEO. Always shout if you have any questions. Leave a comment below or get in touch on Twitter or Facebook.